Connecticut is a quaint colonial New England state. Beaches, wildlife, and easy access to the Long Island Sound shoreline attract visitors. The 1954 USS Nautilus, the world's first nuclear-powered submarine, is displayed at the U.S. Navy Submarine Force Museum in Groton. 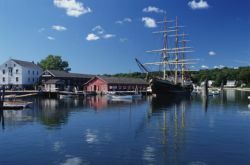 Visitors to Connecticut can also immerse themselves in 19th century maritime life at the historic Mystic Seaport.